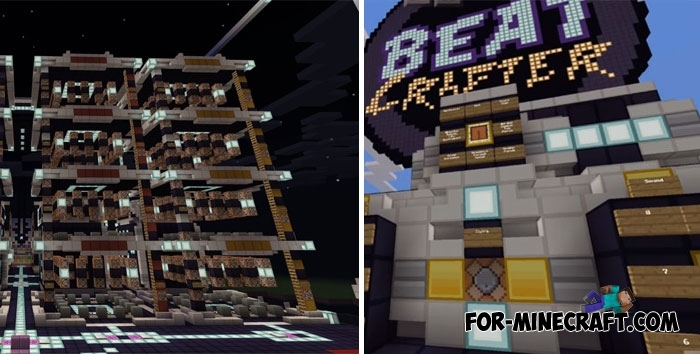 BeatCrafter is a practically professional music maker built in Minecraft PE. It has almost all the sounds available in the game: sounds of mobs, objects, actions and so on. It is clear that creating music is by far not the simplest thing - using a variety of software or applications you can compose your own tunes and songs. But what do you say if the device making music is added to MCPE Bedrock? The BeatCrafter is a huge mechanism consisting of several levels and includes many buttons. I advise you to look at the short manual how to create your first song. Naturally, this will take a lot of time, but due to the wide functionality of this mechanism, each player is able to literally build his own song. Redstone songs map for Minecraft PEHave you ever heard a redstone song? Try it, it's very funny and sounds good that may surprise even the most experienced player..